Click the banner above to add a Hi-Viz Helmet Shop T-Shirt to your Shopping Basket. 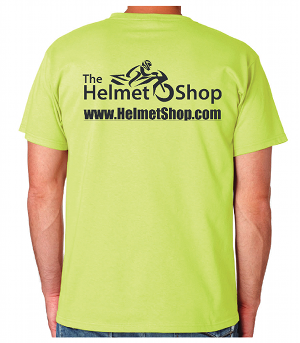 Add a Hi-Vis Helmet Shop T-Shirt in your size to your basket and we will apply a discount of $19.99 on orders over $200. Free Shipping applies to orders over $99 being shipped to the 48 Contiguous United States. Cool Shirt, I will be sure to pick one up while in Daytona.